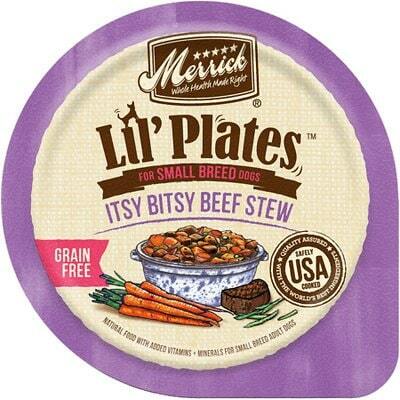 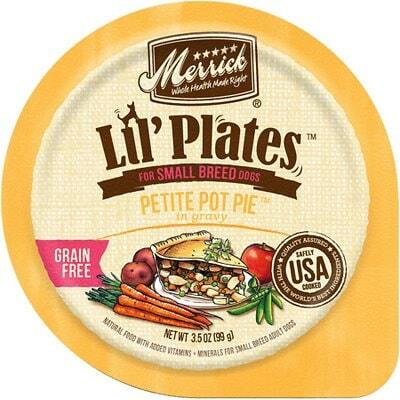 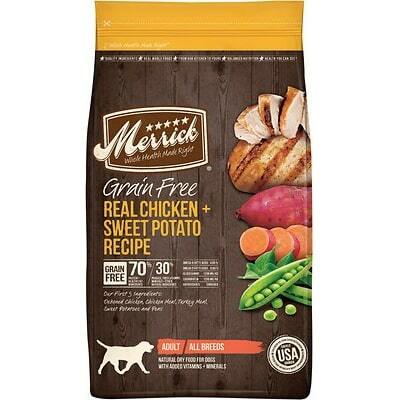 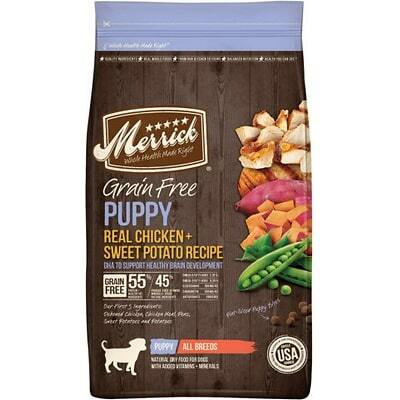 Merrick Real Chicken & Sweet Potato Recipe is a mid-priced dog food with exceptional quality. 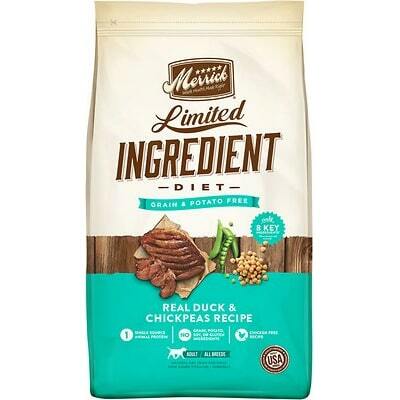 This product has no controversial ingredients, including zero artificial preservatives, colors and flavors - that’s excellent. 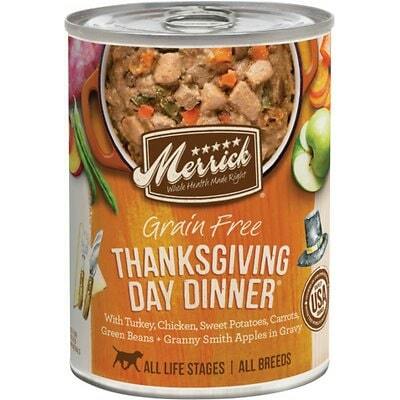 The food is somewhat high in carbs but offers excellent meat and fat quality. 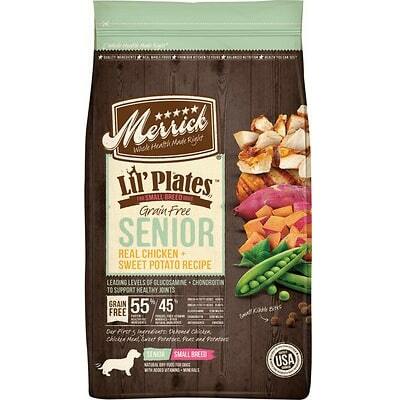 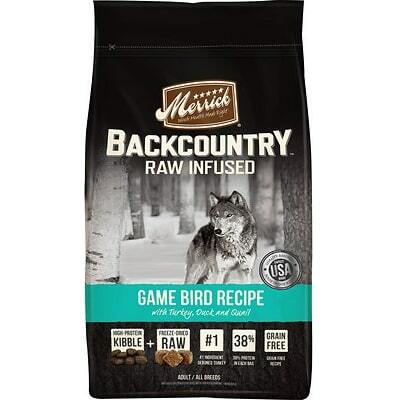 Merrick has no dog food recalls and the company was also extremely transparent when answering our questions. Watchdog Labs highly recommends this product. 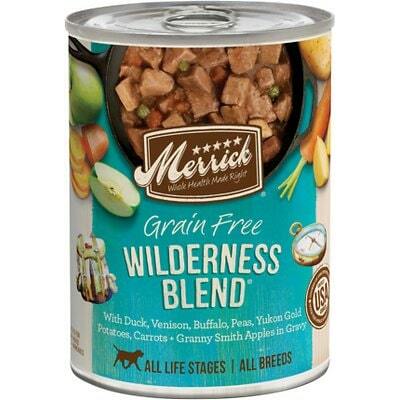 This food has a fair amount of protein fat but is somewhat high in carbs, which is lowering the fat content and making it less nutritionally balanced compared to other dog foods we evaluated. 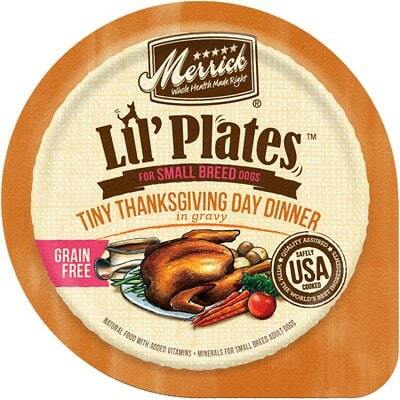 Carbohydrates are cheap so they keep the food’s cost low. 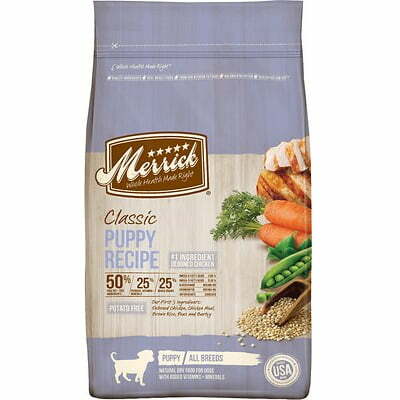 They are nutritionally useful to dogs in the right amounts, however, high amounts of carbs can reduce the much-needed meat-based protein and fat content. 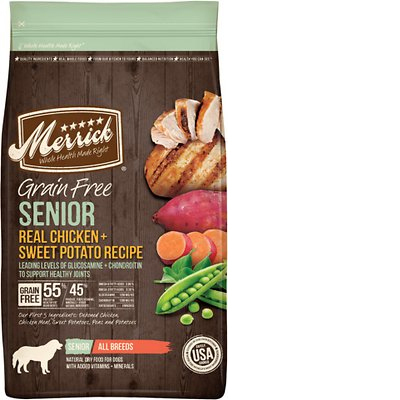 Deboned Chicken, Chicken Meal, Sweet Potatoes, Peas, Potatoes, Salmon Meal, Pea Protein, Chicken Fat (preserved with mixed tocopherols), Potato Protein, Natural Flavor, Salmon Oil, Apples, Blueberries, Gelatin, Salt, Organic Dried Alfalfa Meal, Yucca Schidigera Extract, Minerals (Zinc Sulfate, Iron Amino Acid Complex, Zinc Amino Acid Complex, Manganese Amino Acid Complex, Copper Amino Acid Complex, Potassium Iodide, Cobalt Proteinate, Sodium Selenite, Cobalt Carbonate), Choline Chloride, L-Carnitine, Vitamins (Vitamin E Supplement, Vitamin A Acetate, Vitamin B12 Supplement, d-Calcium Pantothenate, Vitamin D3 Supplement, Niacin, Riboflavin Supplement, Biotin, Pyridoxine Hydrochloride, Folic Acid, Thiamine Mononitrate), Dried Lactobacillus plantarum Fermentation Product, Dried Lactobacillus casein Fermentation Product, Dried Enterococcus faecium Fermentation Product, Dried Lactobacillus acidophilus Fermentation Product, Rosemary Extract.